With the obvious exceptions, I think there’s a stagnation sweeping across all genres of Metal these days. Most bands are so intent on sounding like someone else that they lose their own identity, and to some degree, their originality. The lure of stardom and popularity is incredibly tempting, and most bands never get past a taste of fame. I hate that. I would much rather see a band maintain their own sound and hopefully see that pay off. Selfish? Perhaps. It’s an interesting thing to think about. Luzern, Switzerland’s MAXXWELL comes across like a band that wants to do things their way, and if you don’t like it? Too bad. “Metalized” is quite possibly the best Metal/Hard Rock album I’ve heard this year. Maybe in the past two years. It’s an album of dualities. It’s new yet, traditional. It pushes boundaries yet is comfortable. In the simplest terms, it’s New Melodic Metal, with a Traditional Heavy Metal feel. I don’t know how they pull it off, but they do, and I like it.The album starts off with “Hurricane” and immediately the dual guitars of Hafliger and Montavon grab your attention. Melendez’s vocals took a bit to register with me. He initially sings in a lower more menacing range, that I wasn’t sold on. Then suddenly midway through, there’s another vocal, a softer approach and a higher range. I had to double check the credits to make sure there wasn’t another vocalist! Remember that duality I mentioned? It rears its head again successfully via Melendez. “Back Again” is a straight ahead Melodic rocker that relies on a captivating chorus, yet still maintains the menace just below the surface. P.U.T.V. (Pump Up The Volume) follows, and this one as the title hints, comes across as a fun party anthem. The dualities remain, with overtones of New, Traditional and even Thrash. I was even somewhat reminded of ANTHRAX here. I could easily see this being a key staple of their live show. “She’s Mine” is reminiscent of the best late 80’s power ballads. Great hooks and again strengthened a great sing-along chorus. “Scars” continues where “She’s Mine” leaves off, but this time Melendez’s vocals take on yet another personality, this time reminding me of Anthony Kedis. It really leaves you scratching your head and smiling in a completely good way. Seriously, how have I not heard this band before? This is impressive. Next we have the title track “Metalized”, and then we launch for the stratosphere with “Monsterball”. Haller and Muller lay down a thundering backbeat accented by double kick drums and a sludgy low end riff. Again, I have to think this would be a must see live track. Hafliger simply shreds in his solo slot here. Folks, we haven’t had a bad track yet. “Burn” is another anthem destined for crowd participation. “Done With You” continues the frenzied pace before “Given It All” slows things down with darker, melodic thought provoking lyrics. “The Temple”, and “Raise Your Fist” close out this impressive assemblage of unique Metal with a fury. 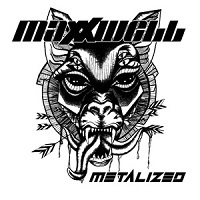 MAXXWELL’S “Metalized” comes at you like a rabid wolf from the very start, and it never lets up even after it sinks its teeth in you. I was completely shocked at how good this release is, and even more so that it’s an independent release. This album and MAXXWELL deserve to be heard.